Home Tags Posts tagged with "uniform dress code"
Hosting Turkish PM Recep Tayyip Erdogan in the White House’s Rose Garden yesterday, President Barack Obama requested a standing Marine to open an umbrella and protect his head from the light rain that was falling. However, according to Marine Corps regulations, not even the President of the United States can request a Marine to carry an umbrella without the express permission of the Commandant of the Marine Corps. The Marine Corp Manual, which is the bible for all soldiers serving, specifically states that a soldier’s uniform dress code does not allow the carrying of an umbrella and “no officer or official shall issue instructions which conflict with, alter, or amend any provision without the approval of the Commandant of the Marine Corps”. Indeed, male Marines are informed never to carry an umbrella from the earliest phases of training. Regulation MCO P1020.34F of the Marine Corps Uniform Regulations chapter 3, rules out any use or carrying of an umbrella while a Marine is in uniform. However, female Marines “may carry an all-black, plain standard or collapsible umbrella at their option during inclement weather with the service and dress uniforms. It will be carried in the left hand so that the hand salute can be properly rendered”. During the press conference, President Barack Obama dodged questions about the IRS’s targeting of conservative groups, shifted responsibility for the Benghazi attack to Congress, and said he offers no apologies for the Department of Justice’s secret seizure of reporter’s phone records in search of a classified intelligence leak. 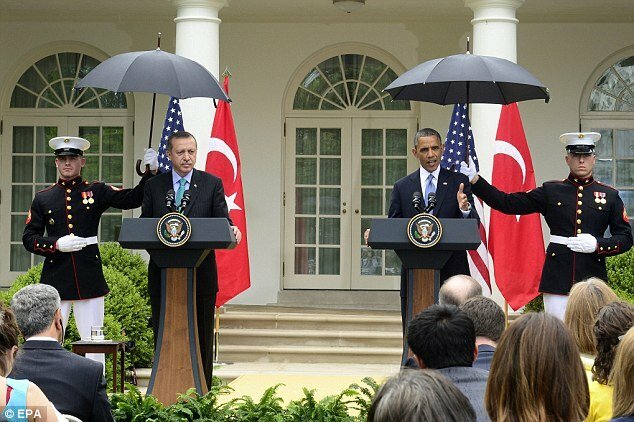 In a rain-soaked Rose Garden press conference originally intended to be a victory lap for the United States’ relationship with Turkey, Barack Obama stood alongside Turkish Prime Minister Recep Tayyip Erdogan and fielded questions which quickly shifted to the trio of scandals that are engulfing his administration. Addressing the Benghazi fallout pre-emptively before Recep Tayyip Erdogan spoke, Barack Obama said that “at my direction, we’ve been taking a series of steps that were recommended by the review board”. He spoke of various measures he was recommending, to “learn the lessons of Benghazi”. But he referred to the murders of four Americans there as an “incident”, not a terror attack. The president said: “That’s why, at my direction, we’ve been taking a series of steps that were recommended by the review board after the incident. We’re continuing to review our security at high-threat diplomatic posts, including the size and nature of our presence; improving training for those headed to dangerous posts; increasing intelligence and warning capabilities. His remarks focused on “properly funding” the State Department and Pentagon-run security at diplomatic posts, shifting the burden to Congress to “provide resources and new authorities so that we can implement all the recommendations of the Accountability Review Board which issued a report last month”. Barack Obama said: “We’re going to need Congress’s help in terms of increasing the number of our Marine Corps Guard who protect our embassies. The review board is under fire for failing to interview high-level Obama administration figures, including then-Secretary of State Hillary Clinton. Interviewing Clinton, Republicans on Capitol Hill have said, would have provided insights into who was accountable for lapses in security that left the U.S. Consulate in Benghazi, Libya vulnerable to attack.